For an individual sauce or a small amount of melted butter. I bought for boiling 1 egg and it is a bit smaller and more shallow than I expected so not sure whether it will work for my primary purpose, but very cute! 21 customers found this review helpful. Did you? Yes, I did! Ideal for making small quantities of concentrated flavours, also good for heating a small tin of baked beans! 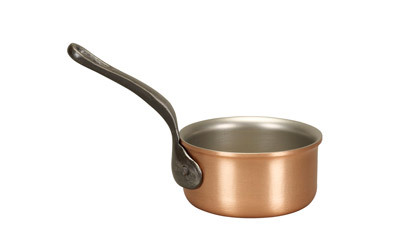 This tiny pan is brilliant for melting butter or frying spices. It is beautifully finished with true Falk workmanship You can even use it to serve a portion in style. It is also essential if you are a bit ocd about collecting all the pieces in the set! so far I have used it for garlic and herb butter to drizzle over a gratin and also warming through cream/milk.It is totally fit for purpose. Thanks Faulk Culinair. quality and customer service is superb. 579 customers found this review helpful. Did you? Yes, I did! It really is small, however perfect for delicate sauces and it really looks good hanging up a real conversation piece! This little Gem, I have used for serving warmed mustards and infusing Saffron with that exotic flair for the unusual. 613 customers found this review helpful. Did you? Yes, I did! I did not realise just how small this pan was when I ordered, (it is tiny). But on picking it up I was surprised at just how solid and well made it is. The weight it has inspires confidence in the quality of this product. The pan itself is finished beautify and contrasts very well with the 'rustic' cast iron handle. In short I'm impressed and will be ordering more! I love this little treasure of the copper collection it is ideal for warming butter and for chocolate sauce too but over the festive season has been ideal for the Brandy for our Xmas Pud! Brilliant! I purchased two items to give to my Son and his Wife last year on the occasion of their wedding. They were absolutely DELIGHTED with them so I decided to buy a smaller version for their first anniversary. Again, they are thrilled. I can see myself adding to their collection over the years, knowing they will be received with enthusiasm. Thank you. Lovely cute pan, can be used for making sauces and use also as container for one portion size accompaniment to your main plate. Good if your dieting to control portion sizing. 661 customers found this review helpful. Did you? Yes, I did!